Don't get distracted by unproductive arguments. Photo by Ben Roffelsen Photography from the Torontoist Flickr Pool. In December of 1974, Private Teruo Nakamura, a private in the Japanese army, was captured on the South Pacific island where he had been hiding out since the Second World War. His captors had to explain to him that his country had surrendered 29 years earlier. Not so long ago, the question “If Toronto had an extra dollar to spend on new infrastructure, how should it be spent?” would produce a wide range of answers. Today, the answer would probably be “transit” 10 times out of 10. Which is a good thing, because it is the right answer. Unfortunately, the good news begins to run out from that point on. One might have hoped that such widespread agreement on an important public need would lead to a cooperative attitude amongst decision-makers aimed at addressing their common goal. One might have expected to see rational policy development on matters of capital spending, funding priorities, and specific policy objectives. But that fond hope would be unlikely to survive an examination of the story of recent transit investment decisions at City Hall and Queen’s Park. And it would have had another devastating setback after witnessing the events of the past few days surrounding the provincial government’s 180 on Toronto’s road tolls. While the main actors in the piece know that transit investment is needed, the problem appears to start with the fact that they clearly don’t understand why. Or if they do, they don’t really care. To the key players it is now evident that transit development is not a matter of public policy; it is a matter of political polling. Posing as a transit enthusiast polls well, so public announcements in support of transit spending are the flavour of the month. Want to win an election? Draw a few coloured lines on card, give it a catchy name, call it a breakthrough transit plan, and you win. Running short on money to finance the City Hall budget and want councillors to vote for a new source of revenue? Just say the money will be spent on transit and win an easy 32–9 Council vote for road tolls. These are not the comments of leaders with their eyes focused on executing good transit policy; they are the comments of politicians focusing their eyes on politics and using transit policy as a stage prop. Our provincial government wants to support “transit”—whatever that means—and wants to be seen to support transit. So far, so good. But if sensible transit policy, like networks of light surface rail in underserved suburban communities, is a hard sell, that’s okay with them; they are happy to finance silly transit policy instead (a subway line to Vaughan that acts like a regional commuter line, and a regional commuter line through Scarborough that acts like a local subway, for instance). They were even happy to go along with a plan to bury an entire surface rail system along Eglinton before City Council’s common sense prevailed. And now we know that, whatever project they are prepared to support, they do not want the voters to catch them slipping them the bill for the cost of building it. No new road tolls on this government’s watch. Instead, the annual revenue that would have come from road tolls—give or take—will flow to municipalities by handing over an increased share of provincial gas tax revenue. As though that won’t simply create pressure to increase provincial revenue from some other mechanism—either from the same heavily burdened taxpayers today or from their progeny in future years as the government sinks further into debt. Bear in mind that the cost of building, upgrading, maintaining, and operating the kind of transit that Toronto and the GTA needs will require all of the revenue that would have come from road tolls and gas tax combined—and likely much more. So what does our mayor object to when the rug is pulled out from under his road toll proposal? Is he concerned about the hit to a well thought-through transit plan based on a clear vision of what is to be done and how it is to be accomplished? No. Because there is no plan and there is no clear vision. To him it’s personal. And that’s enough for him to get into a huff about. His emotional outburst is built around the indignity of finding himself in the same position as the mayor of Wawa, requiring permission from Queen’s Park to do what he wants. After all, he reminds us, his executive can’t even order in a plate of sandwiches without having regard to regulations imposed by the province. But back to matters of policy. Of all the points that cry out to be recognized, let’s start with the easy one: the premier’s decision to withhold approval for Toronto’s road toll proposal came as a surprise and deserves to be called out as such. It is also a cowardly policy decision and deserves to be attacked on that basis too. But the fact that the authority to say yes or no to tolls rests with her, and that she just might decide to exercise that authority, should not have come as a surprise to anyone. A premier is not a rubber stamp. The rules of engagement have been clear all along, and anyone who feels he has outgrown short pants should have recognized that. 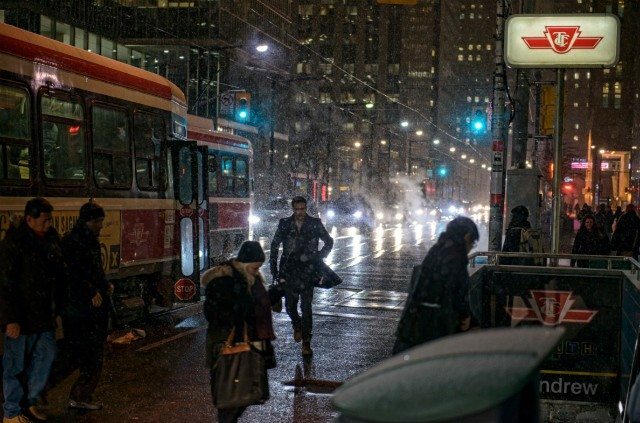 Then there is the slightly more obscure point, which is the role played by road tolls in a fully developed urban plan and transit policy: the whole point of investing in transit in Toronto and the GTA is to form the basis of future development that will accommodate the growth that is expected to occur in the decades ahead of us. It is not to give a break to people who can’t afford cars—although at least one celebrated transit advocate has said that it is [PDF]. It is to keep our city and region healthy and prosperous as it becomes more densely populated. Tolling major roadways can play a role in achieving that policy objective. It’s right there in the provincial government’s own regional growth plan. Taxpayers will continue to finance the lion’s share of the cost of building transportation infrastructure, but users will be expected to pay for the choices they make when using it. Pay a fare when riding a train; pay a toll when driving on a traffic artery. Use the price mechanism of a toll booth to encourage commuters to choose the option that makes fuller use of the public’s higher cost investment and reduces gridlock on the roads. Tolls are not simply a revenue source; they are an instrument of policy. Ironically in the present circumstance, they are an instrument of provincial policy. There is a fair debate to be had around the merits of that policy and the details around putting it into effect. But the cause is not advanced when a provincial leader abandons her own policy when the practical impact of it first dawns on her backbenchers. And it is not helped when the leader of the city, who feels hard done by, makes the debate all about his feelings. Policies are important documents for managing the affairs of the public. If only the people entrusted with executing them didn’t belong in a playground in short pants.